Preparing and loading the plastic filament. 1. First select "Control" from the Touch Screen panel (see Picture 001). 2. Select the "Load Filament" entry (see Picture 002). Picture 002: Load Filament in the Touch Screen Control Settings section. 3. The extruder will start to heat up to approximately 230C. After it does, press the "Next Step" selection (see Picture 003a). Picture 003a: Heating up the FFF extruder. 4. Now begin to physically load your plastic filament into the machine (see Picture 003b). 5. 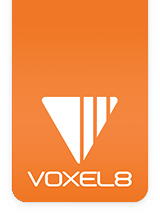 Locate one of your Voxel8 Developer's Kit 0.75kg spools of 1.75mm PLA thermoplastic provided from your Voxel8 Developer's Kit (see Picture 004). Picture 004: Voxel8 Black 1.75mm PLA on a translucent spool. 6. Locate the lid covering the filament bay area (see Picture 005), and peel away any protective covering to reveal the clear plastic underneath. Picture 005: Cover lid for the filament spool bay (with protective cover). 7. Remove the lid and insert one end of the filament into the lower insertion hole (see Picture 006) and carefully feed filament into it until the plastic filament appears at the top of FFF extruder. Picture 006: Inserting the filament into the feed hole in the filament bay holder. 8. You have fed enough filament (see Picture 007a) from the filament bay insertion hole, up through the back (see Picture 007b), when the material shows up at the top of the machine near the extruder (see Picture 007c). Picture 007a: Filament is being dispensed from the bottom, to the top of the machine. Picture 007b: Filament runs through clear plastic feeder tube (see A) to the top of the machine where the extruder is. Picture 007c: Filament is visible inside the clear plastic tube at the top of the machine. 9. Now you'll want to carefully insert the filament into the hole on the top of the FFF extruder (see Picture 008a) while simultaneously depressing the black lever on the top of the extruder (see Picture 008b). This will open the hole directly into the filament feeding chamber and allow you to insert filament correctly. Picture 008a: Feeding filament into the extruder hole. You should insert approximately a 4" (or 100mm) of 1.75mm filament material length downward into the filament feed hole (see Picture 008b). Picture 008b: Depressing the lever, and feeding plastic filament into the FFF extruder hole. NOTE: You must depress the lever and insert the PLA filament downward for about 4" (approximately 100mm). You will know when the filament is inserted properly when you "feel" that the filament has made it past the initial feed chamber. BTW: Some filament may be expelled out of the nozzle when you push the filament in the chamber. 10. You can let go of the black lever on the top of the FFF extruder to release the filament (see Picture 009). Picture 009: Filament is now fed into the FFF extruder. 11. Push the clear plastic guide tube back down into the top of the extruder hole so it fits snuggly (see Picture 010). Picture 010: Reinserting the plastic guide tube into the filament hole. 12. Now you can place the spool of thermoplastic back into the filament bay holder (see Picture 011). NOTE: You'll want to check and make sure that there are no filament twists/loops in the spool (i.e. "filament knots"). This could potentially cause a print failure later (e.g. skipping event). Picture 011: Replacing the filament spool back into the bay holder. 13. The filament spool should now be reinserted (see Picture 012). Picture 012: Filament spool is placed back into the filament bay holder. 14. You can replace the clear acrylic lid (see Picture 013). Picture 013: Clear plastic lid is placed back into the filament bay. 15. With the filament spool loaded and lid back on (see Picture 014), it's time to test to see if the filament properly extrudes from the FFF nozzle. Picture 014: Filament is properly loaded, and the lid is back on (without its protective covering). 16. Press the "Next Step" option (see Picture 015) and allow the machine to extrude some test plastic. Look for this dispensed plastic on the left hand side where the FFF nozzle is located. NOTE: If your machine fails to extrude thermoplastic the first time, recheck to make sure that filament is all the way in the extruder filament hole and that the motor is engaging the material to dispense it. If you're still having issues, then please contact support for help. Picture 015: Extruding plastic after loading filament. 17. If you fail to see plastic emerge from the nozzle, recheck your feed from previous steps, and then hit "Extrude More" (see Picture 016a). When you are seeing plastic dispensed, then press "Finish" (see Picture 016b). Picture 016a: Extrude more test plastic. Picture 016b: Finished dispensing test plastic. 18. Hit the back button (see Picture 017) to return to the main print job file listing. Picture 017: Back to the main touchscreen user interface screen. 19. Once you're dispensing plastic, you're ready to print a thermoplastic (PLA) part on your Voxel8 Developer's Kit Printer.